The Khoikhoi pastoralists, thought to be the original inhabitants of what is now Cape Town, were drawn to the slopes of Table Mountain around 2,000 years ago for the freshwater springs and rivers that flow year round. They named the place Camissa, the “place of sweet waters”. The natural abundance of water also drew early Dutch settlers here in the 17th century to establish a supply station for ships crossing the seas for the Dutch East India Company. Aqueducts, channels, an old sand filtration system, and other relics of an extensive colonial-era water infrastructure can still be found on the mountain. The growing modern city long ago outstripped these natural resources, however, and these local waters disappeared from everyday life. Rivers and streams were encased in concrete, recharge areas for underground groundwater stores were paved over, and distant catchment areas were tapped to feed the city. At the same time millions of litres of fresh water were channelled from the city out to sea every day in storm-water drains. Much of the public discourse around Cape Town’s water crisis has focused on pinpointing causes, assigning blame, and punting technical solutions such as desalination or groundwater extraction to keep water flowing from the taps. The deeper patterns of complex causality, and more systemic approaches to responding to the crisis, do not appear to be well explored. The drought is both a slow-moving crisis and a shock. According to different media reports, early warnings had sounded as far back as the 1990s about various threats to future water security, such as limited dam storage capacity, and an anticipated shift towards a hotter, drier climate. Dam levels have receded steadily and drastically over the past four years as water extraction remained high even when rains failed several times over, with particularly poor rainfall over the dam catchment areas in 2017. Yet it appears that both the local and national governments were unprepared for the crisis, slow to recognise its severity, and slow to respond. Was no one paying attention? 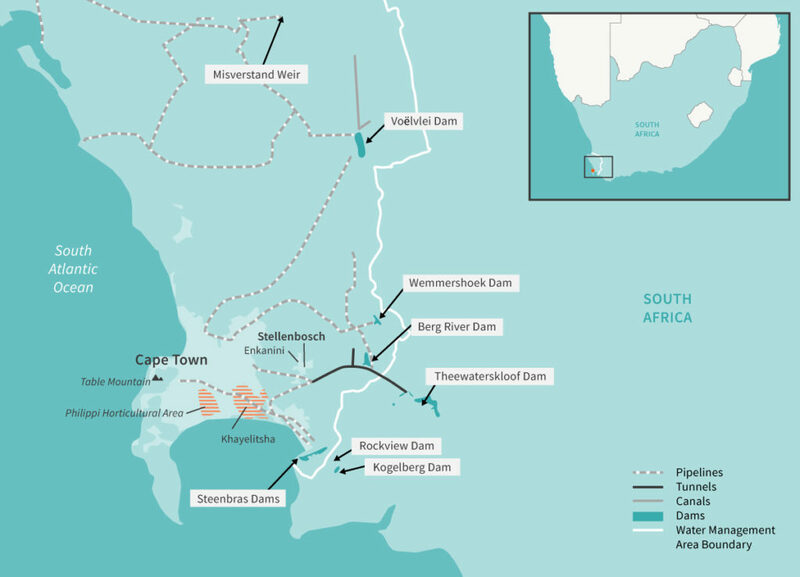 A map of Cape Town, showing the main dams that make up the city’s water supply. Khayelitsha and Philippi Horticultural Area in red hash marks. Illustration: E. Wikander/Azote. For many of Cape Town’s over 4 million residents, the Day Zero announcement in January came as a shock to the system. 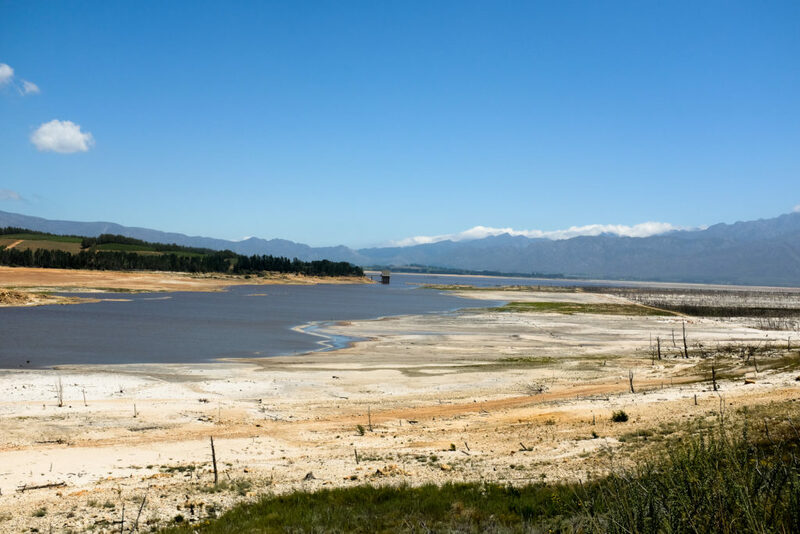 After months of nudging Capetonians to cut back their water usage – with limited results – city officials, alarmed by rapidly falling dam levels in the height of the southern hemisphere summer, declared they had reached a point of no return. In a matter of months, or even weeks, the water supply to homes and offices would be shut off and residents would be forced to queue for emergency water rations at distribution points set up across the city, under police and army guard. Panic ensued, and in the weeks that followed one could rarely find bottled water on supermarket shelves. Rumour and misinformation proliferated, but so did water-saving practices. Day Zero, initially anticipated to land in April, 2018, has now been officially “postponed” until 2019, thanks in part to a sharp response from households, businesses and farmers. If Day Zero was a shock tactic to focus people’s efforts on saving water, it worked. Following the Day Zero announcement, Capetonians’ water usage dropped significantly, while farmers also drastically cut down their water usage from the dams. These actions may have helped to avert a complete system failure, according to Dr Kevin Winter from the Future Water Institute of the University of Cape Town; however the water crisis is far from over. Cape Town’s water system, and the relationship of the metropole to a larger region serviced by the same water delivery infrastructure, could be seen as a complex adaptive system. That is a system that changes and evolves over time in response to different self-reinforcing cycles and changes in context, such as with the onset of climate change. There are multiple causes, relationships, adaptations and interactions happening simultaneously, influencing each other in unpredictable ways. The worst drought on record in a region anticipated to become hotter and drier in future, under climate change. A rapidly urbanizing city in a water-scarce region. A troubled economy heavily dependent on water-intensive agriculture and tourism. Population growth of 50% between 2000 and 2017, outstripping infrastructure delivery, fuelled in part by migration stemming from economic and geopolitical crises across the region. Crises of leadership and governance overlapping at local and national scales. These different dynamics fuelling the water crisis are further exacerbated by profound social inequalities, reflected in the stark contrasts in how poor and wealthy people access water every day, and the disconnects that stem from these fragmented realities. For Nokubonga Venge and her neighbours it has always been Day Zero. She lives in a densely packed and rapidly growing informal settlement of at least 7,000 people, called Enkanini, perched on a hillside above the prosperous town of Stellenbosch in the winelands outside of Cape Town. Standing on the dusty slope outside of her shack, Venge pulls back the flap of a handmade greenhouse she has fashioned from scraps of wood and netting, and reveals 680 wild olive tree seedlings growing in plastic bottles. Every day for nearly a year, she explains, through a long dry winter when the rains did not come, and through withering summer heat, she has fetched water from a communal tap just up the hill from her shack, to nurture these seedlings to life. The young trees are important not only to Venge’s livelihood, but also for the ecological role they are to play. They will be planted along local river banks as part of a broader programme of addressing pollution sources and re-introducing indigenous vegetation to regenerate the health of local waterways. The programme, called WILDLANDS, run by a national NGO called WILDTRUST, is one of numerous small and ongoing social-ecological interventions1 1. Turpie, J. K., Marais, C. and Blignaut, J. N. (2008) ‘The working for water programme: Ecological Economics. Elsevier, 65(4), pp. 788–798. doi: 10.1016/j.ecolecon.2007.12.024. See all references to have gained new significance in the water crisis. Every drop of water she uses, whether it’s for drinking, bathing her 4-year-old son, or watering her trees, must be fetched in a bucket from the communal tap about 100 m away. Such is the daily reality for about 13% of South African households, who have been excluded from the formal bulk water delivery grid. In Cape Town’s largest township, Khayelitsha, it is estimated that around half of the total population (officially 400,000­­–450,000 people, sometimes estimated at 2.4 million), lives in informal housing, relying on communal toilets and drawing water from communal standpipes. Since the end of apartheid, South Africa has failed to close the service delivery gap, fuelling disease, depression and rage in townships and informal settlements across the country. Protests erupt regularly over poor housing conditions and lack of water and sanitation services. And in Khayelitsha, the provision of unsafe, unsanitary portable communal toilets in informal settlements has triggered violent protests in recent years. Consequences have been terrible not only for human health and well-being in informal settlements, but also for the water system as a whole. Raw sewerage and garbage from unserviced areas such as Enkanini finds its way into local waterways, affecting health, farming and other economic activities downstream. 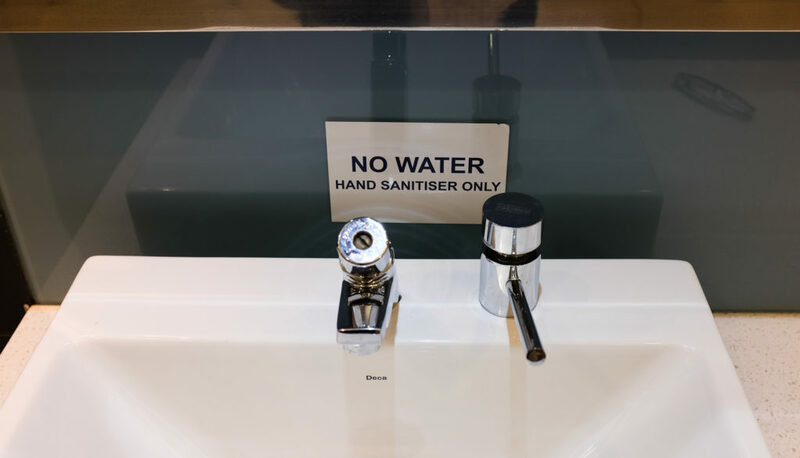 Hydrocide is the term used by Capetonian water researcher and activist Caron von Zeil to describe the social misuse of water – the societal values and behaviours that have adapted over time to become out of sync with the physical environment in which society is embedded. According to Von Zeil, the sheer scale of urban water infrastructure has produced a disconnect in our relationship to water. The impacts of the water crisis have spread far beyond the local context, reflecting the radically open nature of complex systems, shaped by so many different internal and external interactions that it becomes difficult to draw a clear boundary around the system. Tourism and agricultural exports are two key sectors of the Western Cape’s economy, for example, and both have been imperilled by the crisis. For many local fruit and wine farmers, Day Zero arrived in February this year, as they exhausted the water consumption quotas they were allocated for the year. The long-term consequences for the economy, employment and food security are uncertain but could be dire. Hundreds of hectares of citrus trees and grape orchards have already been pruned back or uprooted, and the next deciduous fruit harvest is expected to drop by 20%. Curtailed production means not only less food is produced, but also that as many as 50,000 fewer jobs are sustained, many of them unskilled or semi-skilled. Such trends would seem likely to reinforce persistent crises of poverty and food insecurity that plague the region. However the crisis could also motivate farmers to innovate and adapt their methods. Water-saving techniques such as drip irrigation, or more water thrifty and drought-tolerant crops, could increase their resilience to drought in the future. And some still have water. In the dry heat of late summer, as much of the vegetation around Cape Town is shrivelled and brown, the vast green fields of the Philippi Horticultural Area (PHA) are an almost bizarre sight. Particularly in the midst of one of the most densely settled areas of the Cape Flats, an expanse of gritty, peri-urban townships around Cape Town. Curtailed production means not only less food is produced, but also that as many as 50,000 fewer jobs are sustained, many of them unskilled or semi-skilled. In the area, known as the PHA, cows graze and tractors roll through bright green fields. Farm workers tend rows of spinach, lettuce, onions, carrots and cabbages, framed by a backdrop of sand dunes covered in indigenous vegetation. Here in the PHA, the massive Cape Flats Aquifer lies beneath our feet, a more than 400 square km network of underground sand groundwater stores. Even in the current drought, the aquifer provides abundant year-round water to enable farmers to produce some 150,000 tonnes of fresh produce per year. The water contributes to about half the city’s supply of fresh vegetables, enabling poor and food-insecure households in surrounding communities to access healthy, affordable food, and providing a buffer from the price shocks of the free market. “I want to make the connection between the drought and food, because you can’t farm or do anything outside of the context of your environment,” says local activist Nazeer Sonday, who spearheads the Philippi Food & Farming Campaign. Sonday has argued loudly over the past 10 years to block multiple proposed new housing, commercial and industrial developments that would pave over this farmland. Structures, such as a 40,000-unit middle-income housing complex, proposed to occupy a seasonal wetland area that is a key unpaved recharge zone for the aquifer where rainwater can infiltrate the soil, have been punted by a city relentless in its pursuit of economic growth at the expense of social justice and equality, he says. “Shaped by such complex relationships and dynamics, producing non-linear changes and deep uncertainties, the water crisis can be understood as a problem of the Anthropocene,” says Rika Preiser, researcher at the Centre for Complex Systems in Transition at the University of Stellenbosch. The Anthropocene is the scientific term proposing that humans have now become primary drivers of planetary change. As Carl Folke and co-authors have noted,2 2. Folke, C., R. Biggs, A. V. Norström, B. Reyers, and J. Rockström. 2016. Social-ecological resilience and biosphere-based sustainability science. Ecology and Society 21(3):41. See all references “the scale, speed, spread and connectivity of human actions in the Anthropocene” can sometimes produce rapid and unpredictable changes that escalate and intensify beyond what we can understand or control. Cape Town’s fast-moving water crisis reflects this heightened complexity of the Anthropocene, stemming from complex causalities, and likely to continue to develop and evolve in non-linear, unpredictable ways, connecting sectors and spheres of society across scales. In the crisis, the poor are most vulnerable and less resilient if anything worse should happen. The rich can buy tank loads of water from Johannesburg and fill their pools or rainwater tanks. “The poor will carry the brunt if disease breaks out due to bad hygiene in the water system or shortages in hospitals or clinics,” Preiser says. Today the city’s water is supplied by an innovative and far-reaching network of six interconnected dams collecting winter rainfall from the Drakenstein Mountains and piping it to farms, and urban and residential areas. The current drought has exposed the ecological limits of this mode of service delivery, resulting in the need, as national department of water affairs official Melissa Lintnaar-Strauss puts it, “for everyone to become a water resource manager”. 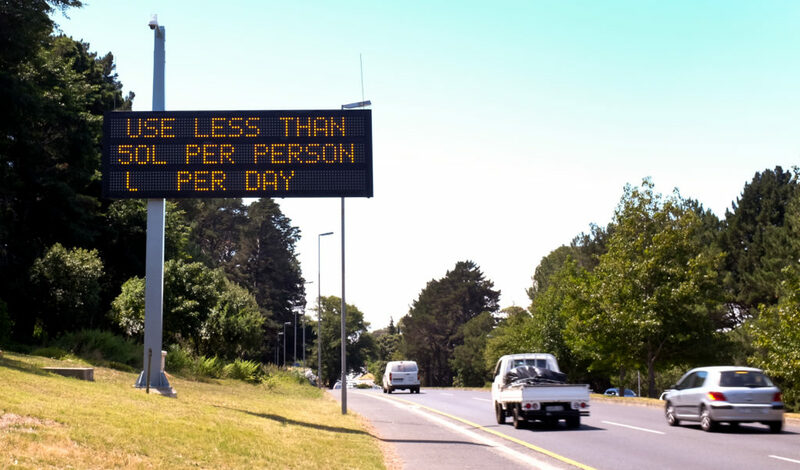 Capetonians’ sudden and drastic response to the threat of Day Zero has produced impressive short-term water savings – the city’s current consumption of around 540 million litres of water per day is less than half of what it was three years ago. According to researchers Martine Visser and Johanna Brühl, from the Environmental Policy Research Unit at the University of Cape Town, Capetonians have achieved unprecedented levels of cooperation in their responses to the water crises, for example with wealthy households reducing their water consumption to the same levels as poorer households. But many different factors – not least, signs of water savings fatigue – could have an influence on how long-term, lasting or sustainable these behaviour changes are. The current crisis has prompted the city, as well as private citizens and businesses, to scramble for alternative water sources, each of which may have implications only to be seen in years to come. Inspired by ideas of treating the city itself as a catchment area, with its many thousands of rooftops, many residents who can afford them have installed rainwater tanks. Others are drilling boreholes to extract groundwater. Although these behaviours may appear adaptive, and could make a short-term difference in relieving pressure on municipal supplies, they also signal a breakdown of trust in the government, and a loss of social cohesion as people seek individualistic solutions. They also risk undermining future resilience and adaptive capacity for these sorts of droughts if they become the new norm. For example, a proliferation of new boreholes could impact on the future availability of groundwater resources. Meanwhile, citizens in densely populated poorer and working-class communities have reacted with outrage to being forced by local authorities to curb their water use. Their perceptions of state coercion may add further fuel to mounting tensions of urban gentrification and social exclusion, exacerbating already volatile racial and class dynamics, as poor and working-class residents increasingly find themselves priced out of the city. It is possible to glimpse ways in which the self-reinforcing loops have played into the crisis. For example, the city did not incentivise water saving early in the crisis, perhaps because the municipality is financially dependent on revenues generated from people using and paying for a lot of water. This created a vicious circle and dam levels dropped to perilous levels. Recent population growth as well as an increase in water-dependent agriculture increased the pressure on water resources, further exacerbating the drought. Such loops are also bound to have an important influence in shaping how the water crisis continues to unfold. For example, the sudden, drastic measures taken by authorities once the extent of the crisis was realised, are likely to produce their own unpredictable and unintended consequences, financial and otherwise. The introduction of fines for heavy users, and a sharp increase in water tariffs, are already putting strain on poorer households. The city’s plans to introduce four small-scale desalination plants in efforts to augment and diversify its water sources further raise fears that residents, many of them already struggling, will bear the costs of this expensive, fossil-energy-intensive technology. Sonday, the Philippi Horticultural Area activist, writes in a recent opinion piece that the water crisis is a “metaphor for the commodification of our commons”. The city, he argues, has been driven by an agenda of commercialisation, and is ignoring local knowledge and solutions to the crisis, and instead aggressively pursuing costly technological fixes that will make water unaffordable to the poor. Negative environmental risks and impacts of desalination are also anticipated. Local scientists have highlighted the risks of desalinating seawater that is contaminated by microorganisms and complex chemical pollutants coming from the 36 million litres of untreated storm-water runoff and sewage effluent that the city releases daily into the sea. Groundwater extraction has also been controversial, as questions remain as to how, and at what scale, it can be done sustainably. The recharge of aquifers from rain that seeps through the ground is a slow process, making groundwater a renewable resource only when seen over long-time scales. Plans to drill into local aquifers could cause extinctions of plant species that exist nowhere else in the world outside of the Cape’s rich and diverse ecosystems. 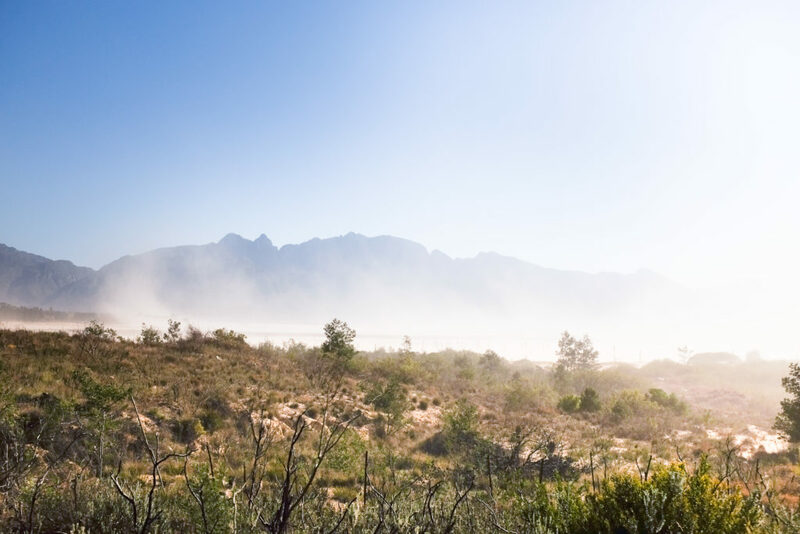 The Cape Floral Region, with its unique fynbos vegetation, is a global biodiversity hotspot of some 9,600 unique plant species. Native plants are often replaced with more water-demanding species, further exacerbating the problem. For some, the crisis exposes the limitations of a traditional governance mode in which the government ensures that water flows from the taps, and few structures exist to engage people more deeply in sharing a collective sense of responsibility for water. New forms of water governance have now started to emerge. In a new context of drought, an experimental platform is increasingly being seen as a model for shifting the roles, relationships and responsibilities of water governance from a top-down, managerial style to new collaborative models of governance of the commons. Nobody knows how much rain will fall into Cape Town’s dams this year, or in the years to come. But people do control how much water they use. Attempts to shift the dynamic have come largely from civil society, while government appears to be caught in knee-jerk reaction mode. It is not yet thinking in terms of the potential for deeper and more long-term transformation, says Charon Büchner-Marais. She is the initiator and coordinator of the Stellenbosch River Collaborative, which has brought together wine producers, growers, property owners, local and national government to address the problem of the heavily polluted Eerste River in Stellenbosch, which connects them all in the landscape. Relationships between corporations, landowners and government officials had broken down over long-standing non-compliance issues, including the release of untreated wastewater into the river. Five years ago, Büchner-Marais, then a PhD student, stepped into the breach and helped to shape a slow process of engagement, which today has helped to mobilise political will and resources to address the pollution problem. Her work helped to foster new relationships and trust among collaborative members. They have learned to see the river as a connecting thread among diverse and often fragmented communities who have a common interest and need to restore the environment in which their lives, and livelihoods, are embedded. The work draws on insights from Nobel-prize-winning political scientist Elinor Ostrom, whose work focused on understanding some of the different ways in which communities around the world organise themselves to take care of common resources such as forests, grazing lands, and, of course, water. New responses more fit for the complexity of the crisis are emerging, for example, in the ways in which people are coming together to respond to the drought. The crisis has mobilised civil society and civic participation. Local neighbourhood groups that were established as neighbourhood watches are now playing active roles in spreading information to local residents and formulating plans to help vulnerable people cope with Day Zero if it should come. 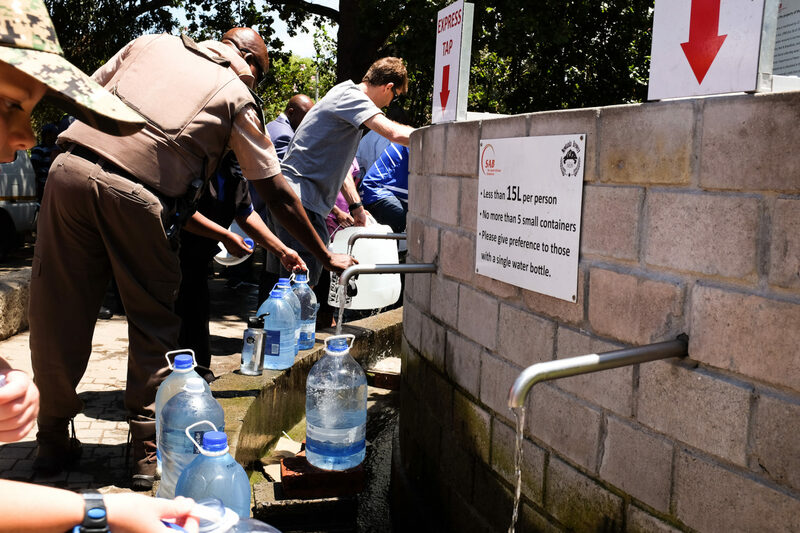 Coalitions of NGOs have come together to engage residents in townships and leafy suburbs alike in understanding their own roles in the water system. ‘‘Our collaborations have come out of a more vulnerable, honest sense of urgency. We want to do something new, and we know we can’t do it alone. You find more people collaborating now in a way that they’ve never collaborated before,” says Kholosa Magudu, a water project manager with the World Wide Fund for Nature in Cape Town. Nobody knows how much rain will fall into Cape Town’s dams this year, or in the years to come. But people do control how much water they use, and they can become more resourceful, tapping the abundance of water in new ways, such as rainwater harvesting and water recycling. Four times as much water falls on the city of Cape Town each year as is consumed by its residents and businesses. Much of this falls on hard surfaces and runs out to sea through storm drains; but it could be harvested from rooftops and stored locally in holding tanks or even channelled into new civic features in parks. The crisis has also brought people back to tap the old, forgotten freshwater mountain springs that were the original sources of community and urban life in the Cape. Now, in several locations around the city, people wait in long queues to fill their buckets, bottles and 10- or 25-litre jugs with fresh, free spring water. At the Newlands Spring in Cape Town’s leafy southern suburbs, one encounters a cross-section of local society, rich and poor. Young working-class families collect water for washing dishes and doing household laundry, to relieve the strain of steep new water tariffs. Micro-entrepreneurs stand about with rickety handmade carts to help people lug their water to their cars, in exchange for a few rands. In these daily interactions, one sees many small gestures of cooperation and solidarity, as people help each other fill their bottles, or let an elderly woman cut in; but also of aggression, tension, and frustration. Many feel that these scenes foreshadow what may happen if the water crisis should deepen and people are forced to queue for water rations. For now Day Zero has been postponed, but the crisis is not over – in fact, in the Anthropocene, it is the new normal for Cape Town and many other cities across the world. The complex causality that underpins this kind of crisis calls for new ways of engaging with multifaceted problems that bridge sectors and scales, environment and society. “Water is the blood stream of the biosphere,” says Johan Rockström, director of Stockholm Resilience Centre. “It determines human wellbeing, and is also an indicator of our failure and success across scales.” What is happening in Cape Town can be seen as a microcosm of what is occurring across the world, as a result of the way humans manage water in this new geographic era – the Anthropocene, he explains. Population growth together with increasing water demand under unsustainable conditions leads to dangerous reductions in groundwater stores and in surface water. This is coupled with global warming, affecting the hydrological cycle, changing rainfall patterns and leading to a human driven amplification of extreme events such as droughts, floods and water scarcity. 1. Turpie, J. K., Marais, C. and Blignaut, J. N. (2008) ‘The working for water programme: Ecological Economics. Elsevier, 65(4), pp. 788–798. doi: 10.1016/j.ecolecon.2007.12.024. 2. Folke, C., R. Biggs, A. V. Norström, B. Reyers, and J. Rockström. 2016. Social-ecological resilience and biosphere-based sustainability science. Ecology and Society 21(3):41.